Using a mobile device such as the iPad gives you the ability to be, well, mobile! There’s no reason to be the teacher that’s anchored to the front of the room presenting a lecture on a whiteboard. You can move about the room and wirelessly project your iPad screen for everyone to see. It’s called AirPlay mirroring. Connect the Apple TV to your projector. Apple TV uses an HDMI cable, so you may need to purchase an inexpensive VGA-to-HDMI converter if your projector doesn’t have an HDMI interface. Set up the Apple TV to the same Wi-Fi network as your iPad. Swipe up from the bottom of your iPad screen to access the iPad Control Center. 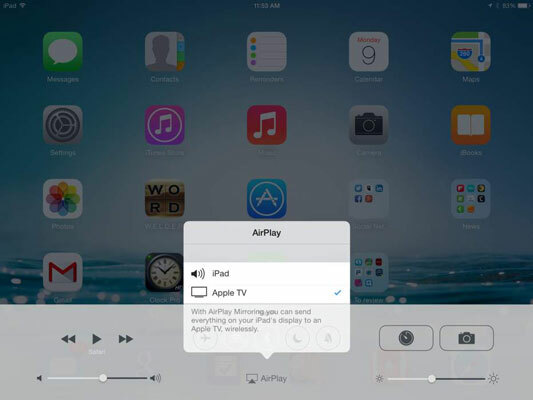 Tap the AirPlay option to see a list of AirPlay devices. Select the Apple TV in your room. Your iPad will be projected, and anything you display on your screen will be viewed by everyone in the room! Consult the Apple website for more information about Apple TV. The 21st-century classroom is moving away from a place of frontal lecturing toward a learning environment that stresses discussion and collaboration. Technology can and should support that vision. The coolest part about iPad mirroring is that you can have students project their own iPads to the Apple TV as well. It’s a wonderful way for students to share and a real bonus for collaborative activities when you want students to display their work for the rest of the class.